We left our little camping spot at about 7:00am, expecting to arrive at Puerto Yungay in time to queue for the 8:00am ferry. It actually only took us about 15 minutes to get to the port. 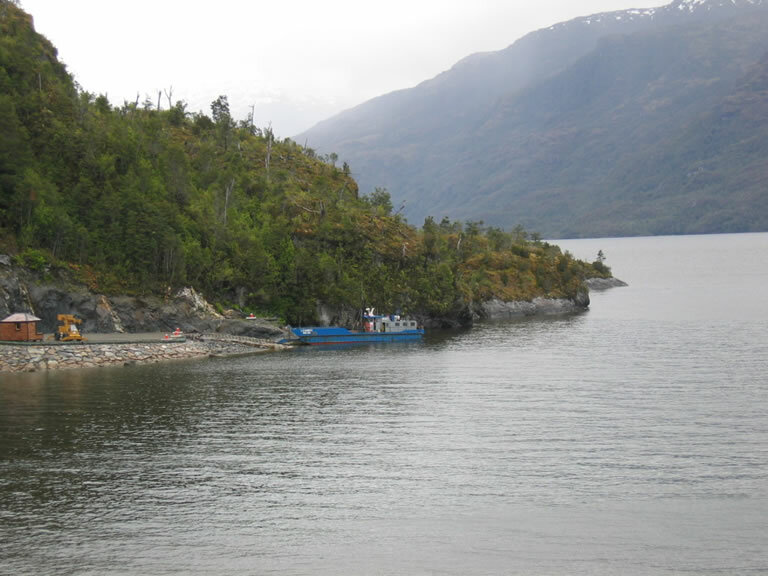 The ferry from Puerto Yungay to Villa O'Higgins is run by the government and is a free service. There are only three crossings a day according to the guidebook and this was confirmed by the man at the petrol station in Cochrane. We were advised that the ferry left at 8am, 12pm and 4pm, took 1 hour to make the crossing and only had capacity for 4 or 5 vehicles. Hence our early arrival to get in the queue - we didn't want to be waiting around until the next crossing at 12pm. When we finally got on, we gave our details to one of the army guys on board - again just written on a scrap piece of paper - and just sat back enjoying the rather misty views. 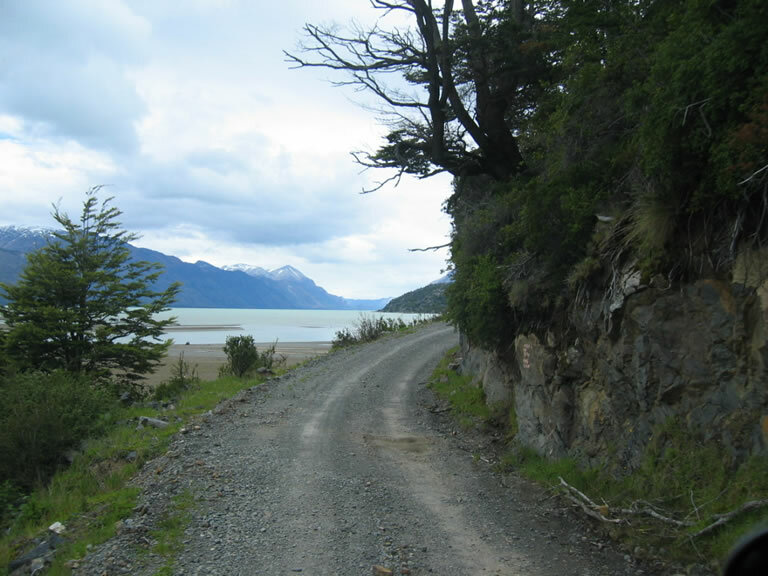 When we arrived at the other end, after the 40 minutes crossing, we let the local cars pass us by before heading out onto the last section of the Carretera Austral to Villa O'Higgins, approximately 100km away. 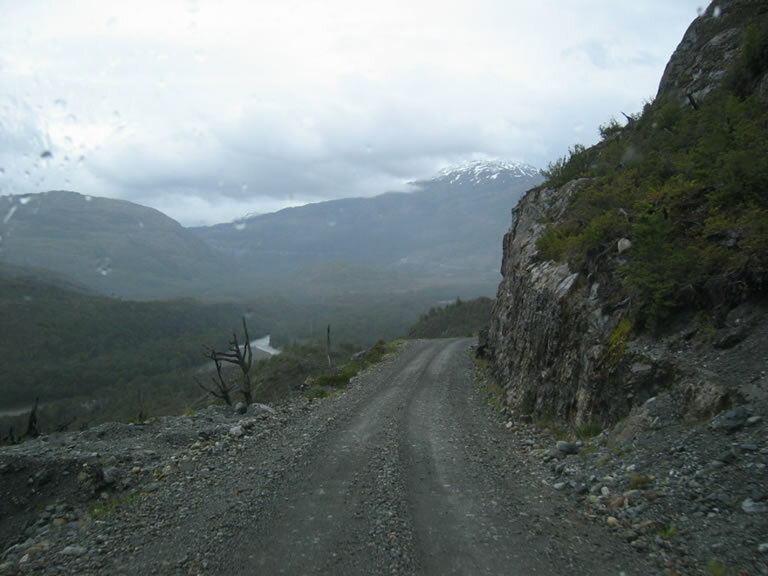 The road was rough and as usual for the Carretera Austral, fairly narrow, curvy and steep in places. 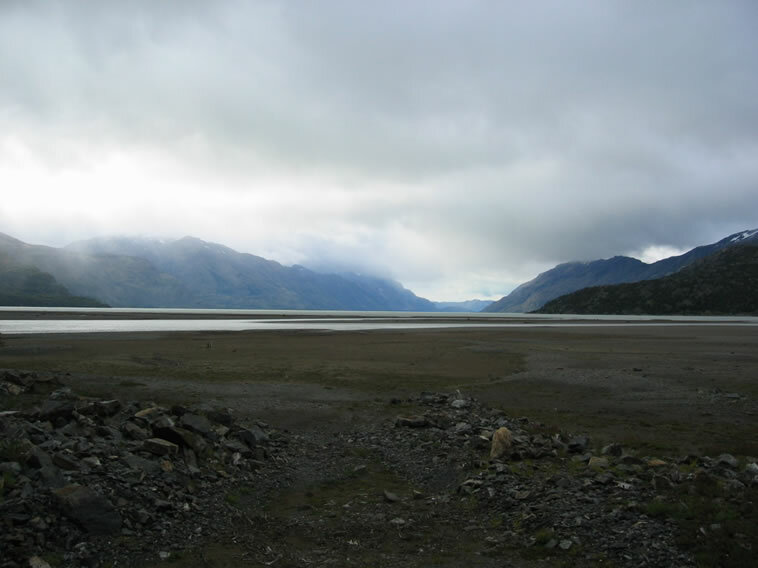 Although it was dull and overcast you could still make out the odd snow-capped mountain in the distance and every now and then sections of dead trees jutting out of the water near the road. It felt very remote and other than the vehicles that had passed us earlier from the ferry, we saw no other cars. 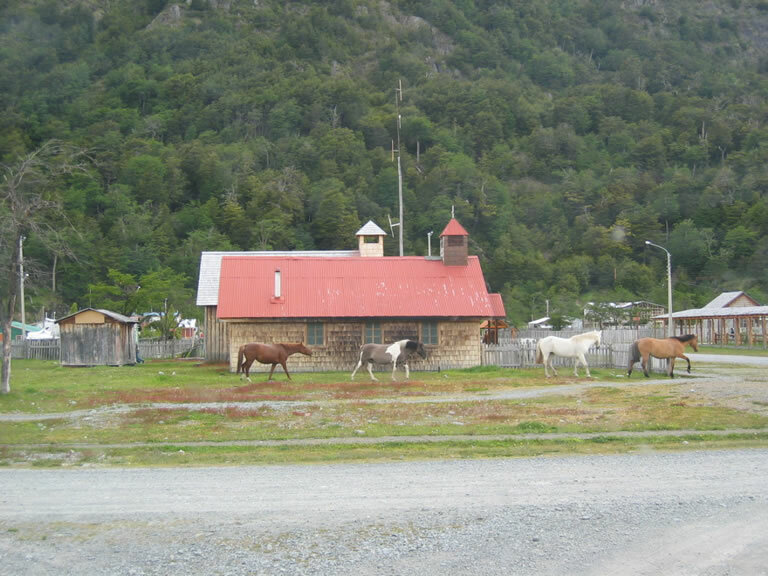 Villa O'Higgins had the feeling of a frontier town and felt very isolated - in spite of the small airstrip. It has just over 450 inhabitants and has only become accessible by road in the last 4 or 5 years. It was very quiet and fortunately looked far from ready for a possible tourism boom. Driving around the town there seemed no obvious places to camp, so we stopped at the police station and asked there. The policeman was very friendly but had not heard of the campsites mentioned in our guidebook, and the only place he could suggest was the local park which was where the local kids played. Not quite what we were looking for. So we headed off out of town to drive as far south as we could and look for somewhere suitable to pitch up. 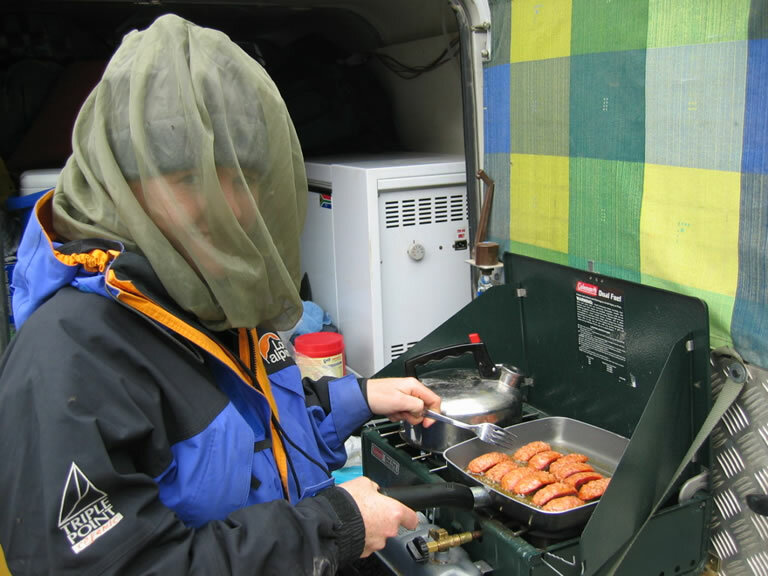 We drove past a few places on the outskirts that offered camping but they looked pretty rundown and we decided we would be better off camping wild. When we got as far south as we could we came across a military ferry moored up. We assumed this was the ferry that could take backpackers/cyclists across to the south side of Lago O'Higgins in order to then continue their somewhat convoluted and arduous journey on foot into Argentina (see Lonely Planet Guide, Chile & Easter Island). At present this wasn't possible in a vehicle. Whilst stopped here we bumped into some people from one of the cars that had come over on the ferry with us. We had a quick chat as they were interested in our vehicle and our trip. 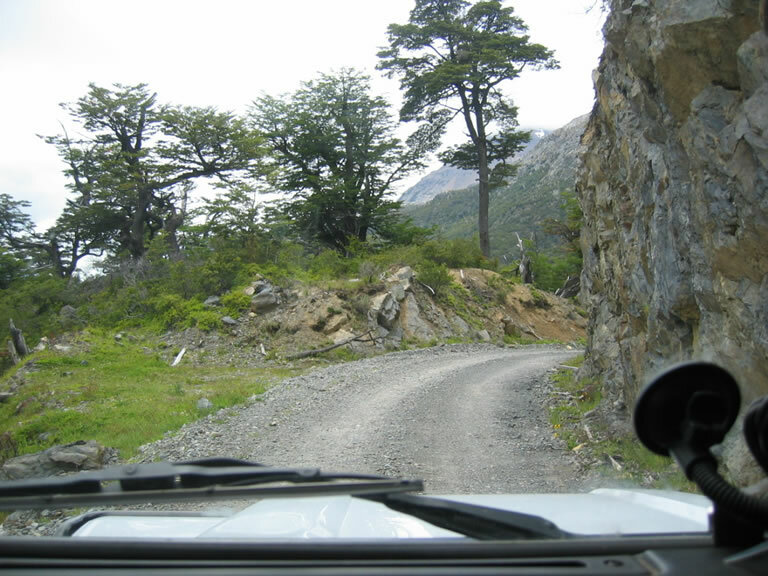 They also explained that mid 2004 a road outside of Villa O'Higgins would provide vehicle access into Argentina. This would obviously mean an increase in tourism in this area in the near future. Turning back we found a nice spot along the side of the road to camp up, although the mosquitoes left a lot to be desired and made cooking somewhat difficult. 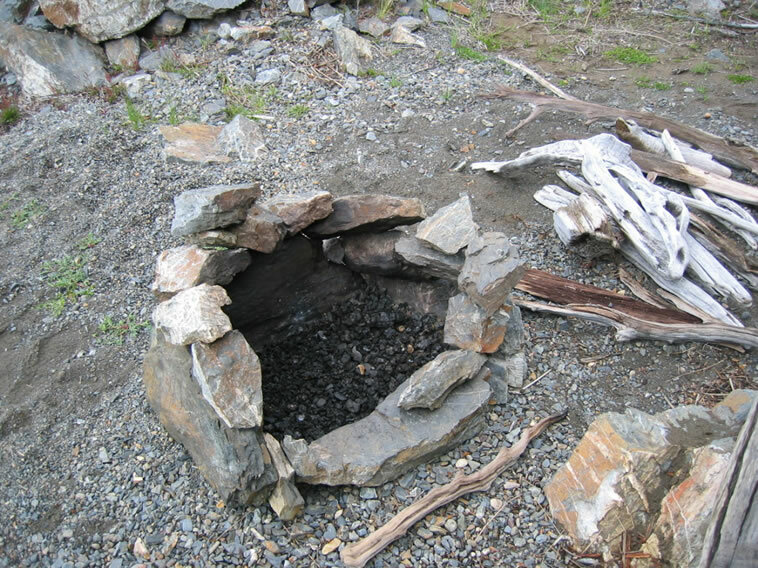 After dinner Ed made a little fireplace on the beach and we sat there, drank hot wine and toasted marshmallows over the fire.